The plans for Reston’s tallest building are getting a few revisions. RTC Partnership and Akridge have jointly filed a Planned Residential Community Plan Amendment for design modifications for the 23-story tower, which was approved by the Fairfax County Board of Supervisors in 2012. 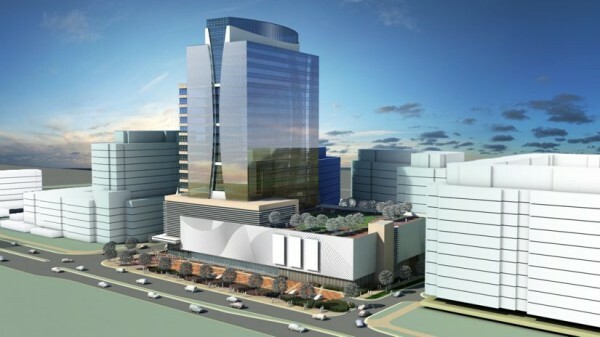 The tower will replace a five-story office building currently on the site at 1760 Reston Parkway. The developers are going back to the board for approval of design modifications on the building entry and pedestrian plaza; pedestrian plaza landscaping; redesign of the rooftop terraces; and the addition of two new private terraces. The plans also call for an increase in parking for the five-level parking garage. It is not yet known how much more parking the planners are requesting. The new plan will go to the Fairfax County Planning Commission is scheduled for May 18,. The $210 million building was controversial when it was approved by the supervisors because of its size, height and distance of nearly a mile from the future Reston Town Center Metro Station, slated to open in 2020. Developer Akridge, which has partnered with RTC Partnership LLC to construct the building, previously said it plans to sign a major tenant for at least 150,000 of the building’s 420,000 square feet before starting construction. Waiting for a tenant would be a lot less risky than proceeding “on spec” as developers say. While office space at Reston Town Center is 100-percent leased, space more than one-quarter of a mile from a Metro station is not as hot. The office tower and ground-floor retail will be about eight-tenths of a mile from the Metro. The current building, which houses a title agency and dentist office, among others, was zoned Planned Residential Community in 1978 and is under no height restrictions. The proposed density of 4.08 Floor-Area Ratio on the 2.36-acre property will not change with the new plan amendments.